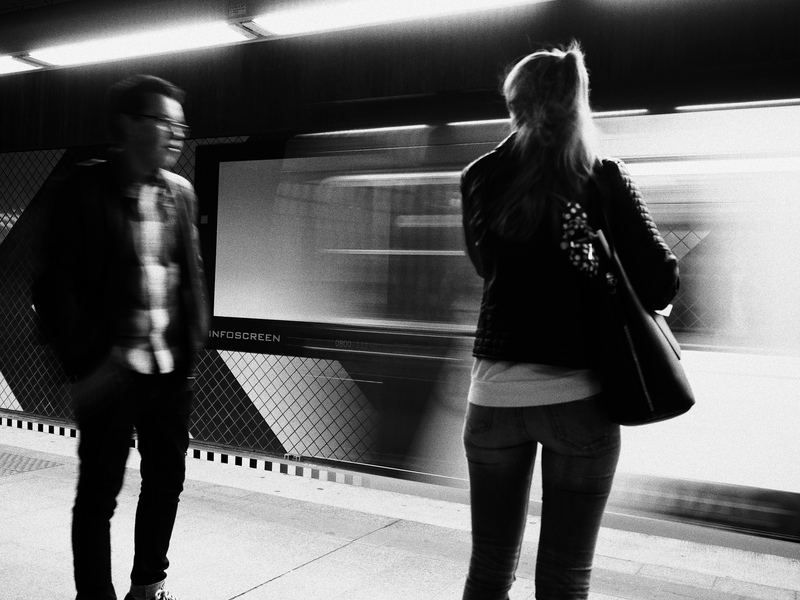 Have I mentioned that train- or metro stations are a great place to shoot Street Photography? 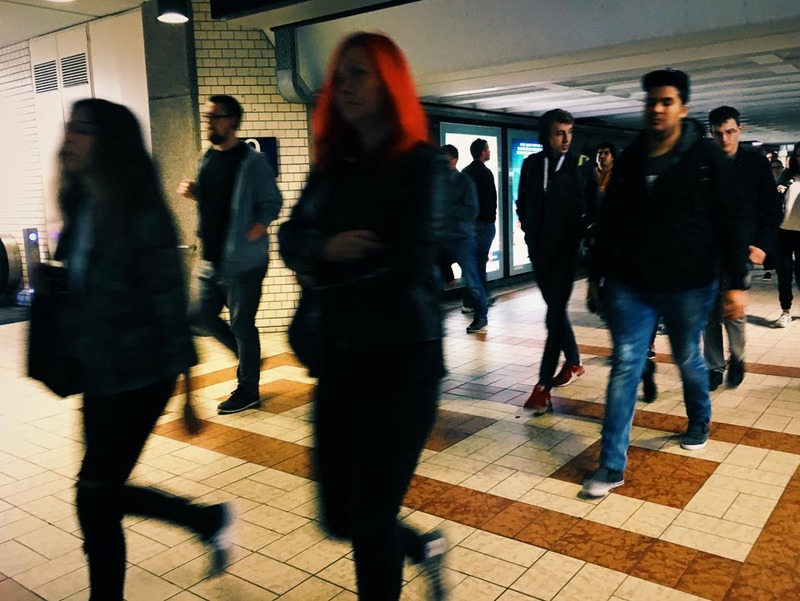 Same as in airports, travelers in stations rushing too and from the trains are often much too busy to notice the photographer on the hunt, especially when you shoot with a small, inconspicuous camera or your phone. Set your camera to “P” mode and look for interesting scenes. Find yourself an interesting background and wait until the right subject arrives, as I did with this business traveler who rushed by my lens in front of the board with the train announcements. If you want to play with motion blur to capture the dynamic of the rushing people, reduce your shutter speed to 1/10 sec which is a good starting point, as if you have a cam with good image stabilization or a calm hand you still can get the static scene acceptably sharp. My Street Photography Quick Tips. Some short, easy to read and easy to use tips that I think could help you while shooting in the streets. Check out some more posts. And for all my free photography tips and inspirations visit my Learning Center, accessible from this link or from the main menu of the blog. Discovered your blog whilst searching for street photography on WordPress. Interesting and informative blog – with some excellent images. So helpful! 🙌 I’ve been wanting to get into street Photography so bad and I think k this should give me an edge!! Thanks for linking to the page 🙂 ! I have been wanting to learn and establish my own style in street photography. But I have been struggling. Thanks for the tips. Marcus – I don’t do much street work. Lately I have done some where there are not many people hanging about. Much more difficult. Leica pre-set focus distance and f stop and also some with my G15 on silent at 28mm. Some decent stuff if I do say so. By the way my wife and I will be in Oregon Sept. 6-13. We are going out to the coast for most of it but will be in Portland for at least a couple of days. We might catch you as we are leaving. I think we are leaving on the 12th. We are going out to the coast with our boys and are returning just about when you will be arriving. I’ll let you know when we firm things up more. The clicks are awesome as well as the tips. Thanks for sharing such beautiful stuff. I am a new blogger .. Please check mine… And feel free to follow back. Your views would be immensely appreciated. Oh these were good tips! The motion blur tip especially. As I read this I thought back to some photos that I took with my smartphone that had blur…now I’m gonna have to go rifle through them to see if I find any quality ones lol. Thanks! You just made street photography look so cool & enjoyable.Thank you for the tips . 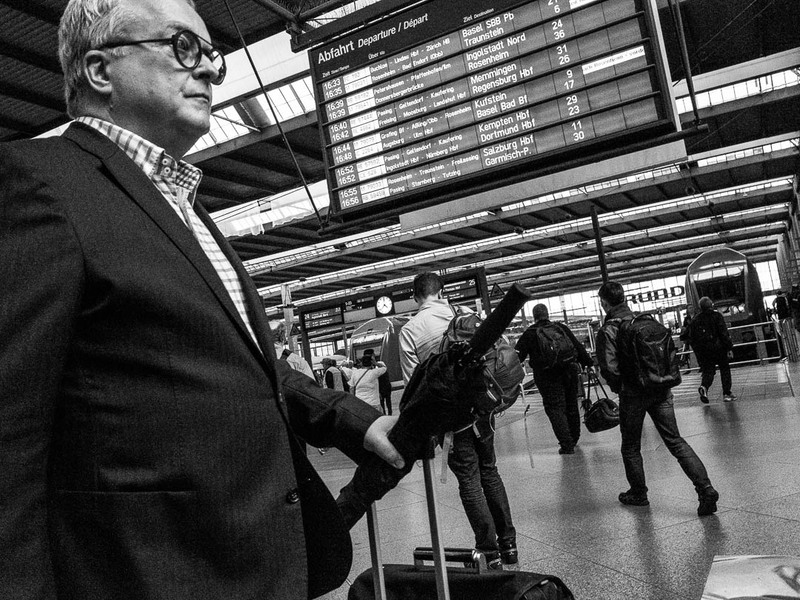 Being a travel blogger & photographer, I have not made much of train stations or airport rush. I conveniently considered such places as where I can put the camera away and stare at people with their lives walk past. very informative Thanks for sharing.. Thank you very much for sharing this information with us. I really enjoy your art! Keep it up! Please follow and like my blog https://adal2com18.wordpress.com/2017/03/27/%EA%B5%AC%EB%A1%9C%EC%98%A4%ED%94%BC-%EC%95%84%EC%B0%94%ED%95%9C%EB%8B%AC%EB%A6%AC%EA%B8%B0-%EC%95%84%EB%8B%AC-%EA%B5%AC%EB%A1%9C%EB%A7%88%EC%82%AC%EC%A7%80/?frame-nonce=c50f3eff23 thank you!. Thanks for the awesome feedback 🙏😊! Checked out your cool blog and look forward to following 👍😄Happy Easter! Looks great. Which country is this in? You are very welcome, love your feedback 🙂 ! Thanks so much for the techniques. Just learning how to take photos, find this post very helpful! Always find such helpful and inspiring tips on here. You always make me want to go right out there and give one or two a try and I will have to post some result pictures some time. 😉 once I get as awesome as you. Great work as always my friend. Marcus, thank you for this great tip. It’s wonderful that you even shared with us settings for shutter speed. I am still struggling with motion blur and have to practice more. I like very much all these photographs. Especially the last one. I see the beginning of conversation there, the beginning a story. Thank you very much for this great feedback! It really means a lot! I’m enjoying these great tips on street photography, Marcus! Thank you so much, your kind comment is highly appreciated. Freue mich über Dein Feedback, und bist immer herzlich willkommen beim Stöbern…. When I shoot street I carry my camera with the strap wrapped around my wrist and shoot from the hip. It’s on burst and depending on lighting higher or lower ISOs. I use back button focus. That allows me to photograph moving objects by holding in the focus button. Thanks Tim, especially for providing your techniques. I need to work on my back-button routine. Although both my Olympus cams can be set to back button focus I never really got the hang of it. It does take some getting used to. The first time I’d set my camera to back button focus, I’d forgotten and could not figure why my focus was not working when pushing the shutter button half way down. Now that I’ve got used to it and find it very useful, I’d not go back. Well that sounds enjoyable. I see a lot of images of Chihuly’s glass creations. Beyond that I don’t know much about Seattle. Marcus, best with all of your shooting. If you get stumped with the back button set up. I would think that YouTube would be helpful. You are very welcome, and thanks so much for commenting 😊🙏!